Miyakonojō, along with Chiran, Kengun, and Bansei, served as the main airfields in Kyushu that were used by Japanese Army pilots to make special (suicide) attacks during the Battle of Okinawa in 1945. Miyakonojō had two airfields, east and west, from which special attacks were made. On November 15, 1977, a monument was erected by the Miyakonojō City Special Attack Corps War Dead Support Association at the prior site of Miyakonojō East Airfield, which is now an industrialized area with no traces remaining of the former airfield. The monument is located in a very small park within the industrialized area. The front of the monument has the following words: "Special Attack Squadrons Takeoff Location." The right side has engraved these words: "Former Miyakonojō East Airfield Site." In the latter stages of the Pacific War in the outskirts of Miyakonojō City where Miyazaki's military leaders were located, Miyakonojō West Airfield and Miyakonojō East Airfield were used as Army tokkō (special attack) bases. From April 6 to July 1, 1945, 79 young men in 10 Shinbu Squadrons took off from both airfields in special attacks. In the first half of 1944, Miyakonojō East Airfield was hurriedly constructed as an airfield from rice fields of the Okimizu River basin after the Navy obtained cooperation of local residents. The surface and rough taxiway were made into a shape that extended like octopus legs about 1,500 meters north to south and 500 meters east to west. It was just like a natural grass-covered plain. In the beginning the Navy trained at this location with Zero fighters, but in March 1945 preparations were made for the expected Battle of Okinawa. The 101st Hikō Sentai (Flying Regiment), equipped with Type 4 fighters (nicknamed Hayate) under the command of the 100th Hikōdan (Air Brigade), was deployed. After that time it became a base used only by the Army. On March 18 of the same year, the West Airfield received an air attack. However, the East Airfield's special attack aircraft avoided the air attack by using the runways like octopus legs and being hidden in various shelters near the forest and foot of the mountains. Moreover, since the unit's barracks were half-underground bunkers in a hilly area about 50 meters long on the southeast side, special attack planes took off from this airfield until the end. On April 6 of the same year, 8 men from 10 volunteers of the 101st and 102nd Sentai (1st Shinbu Special Attack Squadron) took off as part of the 1st Combined Air Attack  (included special attack sortie of Battleship Yamato). On April 12, the remaining two men of the 1st Shinbu Special Attack Squadron took off as part of the 2nd Combined Air Attack. Many special attack planes and buildings were directly hit in continuous air attacks on the west airfield on April 27 and 28 of the same year. There were 18 men killed in these attacks. Moreover, not being able to do repair operations due to time-delay bombs, the 61st Shinbu Squadron (7 men) scheduled to take off together with the 5th Combined Air Attack hurriedly moved to the East Airfield and took off from there . They took off one after another, and the lives of many young men were lost in battle. On August 15, the war ended. We pray that the souls of these men may rest in peace and that generations to come may know that Japan's peace was paid for by their noble sacrifices. We sincerely pray for realization of eternal peace and prosperity for humanity. There were also Special Attack Corps members who took off alone. 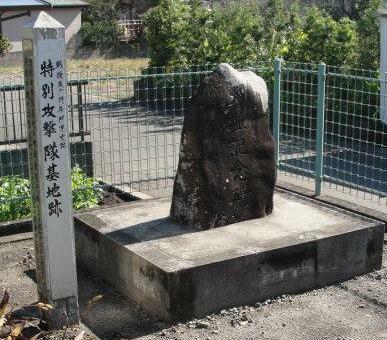 About one kilometer west and slightly south of the Miyakonojō East Airfield Monument there is a sign post with a small monument next to it (shown below) in a corner of the parking lot of the Mihara Area Community Center. A special attack base  was constructed in 1944 with the name of Miyakonojō East Airfield. As a sortie base for Okinawa special attacks, 69 young men took off from here. 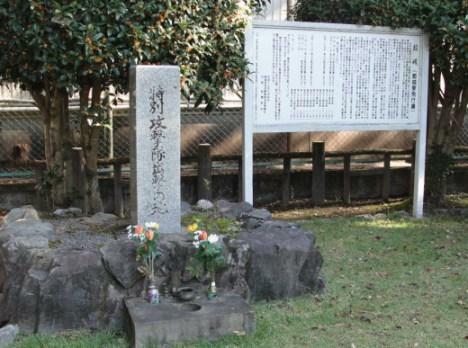 The monument next to the sign post has nothing to do with Miyakonojō East Airfield. It is a monument in remembrance of settlement of the area in December 1946. 1. The numbering used for the Combined Air Attacks mentioned several times in the base history is similar to that of the ten commonly designated Kikusui mass air attacks made by the Japanese military during the Battle of Okinawa, but the numbering is not exactly the same. 2. The 61st Shinbu Squadron took off to make special attacks on April 28, 1945. 3. This statement is incorrect, since the Japanese Navy had not implemented special attacks in the first half of 1944 when the base was constructed. The Navy carried out the first official aerial special attacks in October 1944 in the Philippines.